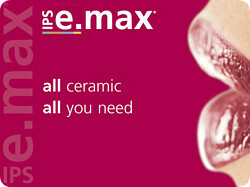 " Choose between traditional e.max Press ingots or CAD/CAM-fabricated e.max CAD blocks "
Why a monolithic e.max crown? 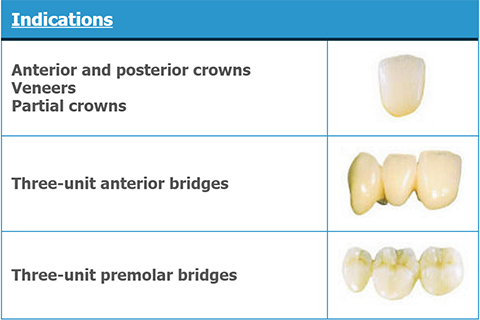 The weak link in any PFM crown or any zirconia crown is not the coping. Cast metal or milled zirconia copings are both strong enough (>1000mpa), but the interface between the coping (25-40mpa) and the porcelain veneer (90-110mpa) built to cover the coping, are inherently weaker. Most observers agree, ceramic failures, whether on metal or zirconia, fail at these two “weak” points. 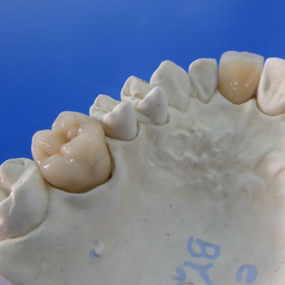 Through staining or cutback technique, An e.max pressed “Monolithic” crown has no interface, and no layered veneer. 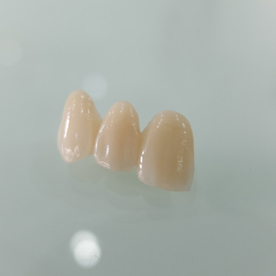 And because the ceramic ingots are blended with dentin colored and translucent ceramics, these crowns match dentition with natural translucency in cusp/incisal tips. Our specialized technicians choose from a variety of ingots such as LT, MT, HT, Impulse, and the newly-released Multi ingot. The demand for aesthetic all-ceramic restorations is continuously increasing. Depending on the case at hand and the preoperative situation, you can provide your patients with individual restorations that exhibit impeccable aesthetics and the required high mechanical stability, since IPS e.max comprises highly aesthetic and high-strength materials for both the PRESS and CAD/CAM technique. The restorations are suitable for both adhesive and conventional cementation.